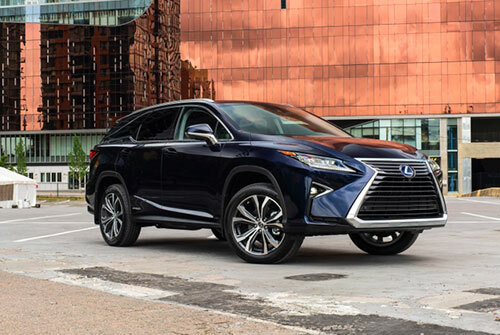 Lexus' top selling SUV, the RX series, has received a boost for the 2018 model year in a move that instantly makes it competitive with three row luxury people haulers. It, as you probably guessed, is the RX 350 L, the L indicating that the vehicle has been stretched a few inches (about four, in fact) to allow for the installation of a third-row bench. It isn't a third row like you'll find in a minivan, but it's in line with some of the competitors whose Steerage class seating is more of the "emergency-public-transit-alternative-type" of vehicle. Click on the picture to open a slideshow. That means adults won't want to spend a lot of time there – we checked this out with my son, just to make sure – but they can if the have to. And in the meantime, those of the smaller and/or shorter persuasion should be fine for a while, and for the times you don't need the extra bum holders the power-folding third row can be stowed flat for extra storage. The RX has always been a great vehicle, though not really a "driver's car" per se. So, if you're looking for Porsche-like performance or feel, you're better off looking somewhere else. That said, if spirited driving isn't as high on your list as comfort, creature comforts, quality of construction, and technology, this Lexus could be the top choice. Heck, there's a reason it has been selling so well for so long. I have some experience with the RX beyond driving review samples for a week: a decade or so ago, I drove a Lexus dealer's customer shuttle – an RX 330 – on Fridays and grew to really like and respect the vehicle. That one had a better manual mode on its automatic transmission than the RX 350 L with which I just spent some quality time, but other than that (and the current generation's unfortunate exterior uglification) they're very similar in manner and method. And that means it's an excellent vehicle that will coddle its occupants beautifully while, being a product of the Toyota family, undoubtedly running forever. Pretty hard to argue with that! Lexus Canada's sample RX 350L was a base model (base, of course, being relative in the luxury market) that carried a MSRP of $66,050. It came with everything you really need in a vehicle, and a lot more, but it also lacked some things that I like in a vehicle – such as paddle shifters for the transmission's manual mode (though, that said, it isn't the greatest manual mode anyway, though it'll be fine for such things as engine braking down hills, etc.). The RX 350L comes with a 3.5 litre V6 engine Lexus says delivers 290 hp and 263 lb.‑ft. of torque, using regular-grade gasoline – a nice touch when gas prices go up and down like a toilet seat. Power gets to all four wheels via an eight-speed automatic transmission that, other than my manual shifting whine, works well and is great under most circumstances. On the other hand, when pressed it seemed reluctant to downshift for those times when you want to pull out to pass, or climb hills. There's also a hybrid version that comes with a continuously variable transmission. I'm glad Lexus sent the regular version. All 2018 RX models in Canada are all wheel drive and feature Lexus' Drive Mode Select system, which the company says delivers "improved acceleration and steering performance" via drive modes of Eco, Normal, and Sport. Hybrid models can also be operated in electric-only EV mode for short distances, though in my experience with other such vehicles it's mostly a waste of time unless you enjoy getting your doors blown off by pedestrians. To me, those driving modes should be marked "Eco, Wallow, and Less Wallow," because that pretty much sums up the suspension feel. This hearkens back to my earlier Porsche dig, though I doubt the RX's customers will feel the same way about it that I do. Heck, I loved the RX but that soft suspension really turned me off. The good news is that you can up the sportiness ante via some F Sport packages that, while mostly cosmetic, do offer some extra performance stuff such as an Adaptive Variable Suspension system and the SPORT S+ setting on the Drive Mode Select system. The bad news is that, according to Lexus Canada's website, the F Sport packages are available only on the short wheelbase version of the RX 350. So, if you want the extra fun quotient, you have to lose the third row. That's a compromise with which I could live. Obviously, the RX 350 L is mostly about the "L", the third row of seats. So how do they work? Not bad. The second row is pretty easy to move out of the way to give access back there, and we gave the system a real torture test, taking my kids and grandkids to the Calgary Stampede, which required not only the use of all three rows, but also the installation of two of those ridiculously massive child seats our betters make us buy and use. My son put the seats in the second row, because the third didn't give enough room for them to be mounted without amputating my grandkids' legs (though I have to admit we thought about it…), the seats taking up the outside right and centre seats of the second-row bench. This made moving the left-side seat difficult to give access to Steerage. My son volunteered to sit back there as proof of concept and it was so tight getting in and out that, coming home, he opted to drop one side of the third-row bench and just crawl into the other side via the hatch/storage area. The upshot is that, if you're doing to do this, make sure it's someone you don't like very much that you put there. Another thing I liked about this "entry level" trim level was that it featured a mouse-like thingy to control the cursor on the big LCD screen atop the centre stack. I don't like this system because it takes too much attention to use it – but it's far, far better than the damn trackpad you can get with other Lexi. The only options available for the long version of this vehicle are captain's chairs for the centre row, which adds about $800 to the price and are probably really nice, and the Executive Package (about $5,300). The latter has some stuff I might choose (especially à la carte, which isn't offered), such as a head's up display (I like digital speedometers and the HUD should include one), upgraded Mark Levinson Surround Sound audio system, automatic air recirculation, upgraded leather and power seat adjustments, and more. Naturally, the RX 350 L also comes fully equipped with safety stuff, including all the usual bags and belts and the electronic nannies that are becoming so obtrusive industry-wide. This includes a Pre-Collision System (PCS), Lane Departure Alert (LDA) with Steering Assist, Intelligent High Beam (IHB) and High-Speed Dynamic Radar Cruise Control. I must report that we had an issue with the pre-collision/adaptive cruise control systems on one trip to Banff National Park. We were cruising along serenely and sedately, the adaptive cruise slowing us down when we came up behind oafs who couldn't even manage the speed limit (though it slowed us down far too early, in my never humble opinion, despite it being set to its weakest setting). So, I pulled out to pass and about halfway through the manoeuvre some idiot pulled out ahead of the vehicle we were following, causing that driver to jam on the brakes (it wasn't necessary to jam 'em on, but there are a lot of stupid drivers out there, especially in the mountains during tourist season). The Lexus slowed down in reaction, but not enough, and then the "pre-collision" warning came on, taking my eyes off the road just when they should be locked on the traffic. Yet the RX continued to approach the bumper of the oaf ahead of us and I had to intervene with my own pressure on the brake pedal. And that did the trick. So much for autonomous driving! To be fair, I've been in situations several times when this type of thing happened, but this was the only time the vehicle didn't do the job itself, though it was also the most extreme example of the phenomenon that I've experienced. It makes me think this may have been one of those "exceptions that prove the rule," scenarios, but I would be remiss in not mentioning it. And, to be even more fair, on another trip the system brought the RX L to a complete stop behind another vehicle – at a stop sign – without any intervention on my part. You can bet my foot was hovering about a millimetre over the brake pedal, just in case, though! Other than that incident, which was actually more freaky for my passengers than me (they were busy rubbernecking the big Rocky things outside and didn't notice the lead up to the heavy braking), the RX performed its job beautifully. It's a fine vehicle that treats its occupants (and, undoubtedly, its owners) like honoured guests. Sure, it's no "driver's car," but that's not what Lexus has wrought here. And there's a reason the RX is Lexus' top seller.